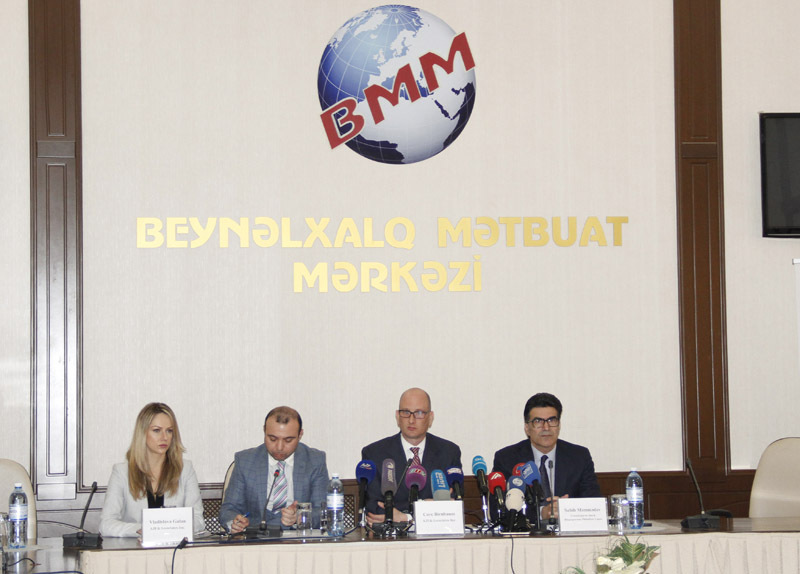 US-based Arthur J. Finkelstein & Associates and the Citizens’ Labor Rights Protection League have announced the results of the pre-exit poll survey conducted in connection with the April 11 presidential election in Azerbaijan. At a press conference on Wednesday, the director of the US firm, George Birnbaum, said that 83 percent of the respondents said they will vote for incumbent President Ilham Aliyev in the upcoming election, APAreports. According to him, 3/4 of the respondents in total expressed their support to the head of state. The survey was conducted in 50 districts on March 13-22. The survey involved 1,500 respondents from various districts of Azerbaijan. When asked “How often do you participate in the parliamentary or presidential election?”, 74 percent (1,110 people) answered that they always participate in the election, 10 percent (150 people) said they will participate in the presidential election April 11, 2018 for the first time, while 12.6 percent of respondents (189 people) said they participate sometimes or in rare cases, Birnbaum said. George Birnbaum noted that when asked the questions “If the presidential election was held today, and the candidates were the following persons, who would you vote for?” and “If the parliamentary election was held today, what party would you vote for?”, 82.9 percent of the respondents (1,244 people) said they would vote for Ilham Aliyev and 70.9 percent (1,064 people) said they would vote for the ruling New Azerbaijan Party. When asked “How do you assess the work of the current government?”, 28.9 percent (433 people) answered “excellent”, 27.1 percent (406 people) answered “good” and 19.9 percent ​​(299 people) answered “average”, he added. Birnbaum said that each of these answers is positive, and in general, 75.9 percent of the respondents (1,138 people) assess the current government’s activity as satisfactory. Thus, 62.5 percent of the respondents (937 people) said that the Azerbaijani economy is strong, 65 percent (975 people) said there is freedom of speech in Azerbaijan, 63.6 percent (954 people) said the country’s leadership protects the people from terror, 62.5 percent (938 people) agreed that if the leadership of the political leader is supported, Azerbaijan will be even stronger, Birnbaum noted. This is while 62 percent (930 people) said that human rights are protected in Azerbaijan, 63.1 percent (946 people) said that Azerbaijan is an island of stability in the region, and all these answers reflect the population’s faith and support for the current authorities, Birnbaum said. He added that when expressing their attitude towards Ilham Aliyev’s presidential activity, 58.7 percent (881 people) said he improves the economy, 61 percent (915 people) said that he cares about citizens, 75 percent (1,125 people) said that he represents Azerbaijan well in the international arena, 60.7 percent (911 people) said that Ilham Aliyev protects the security of the country, and 58 percent (870 people) said that he prevents the spread of the migration crisis to Azerbaijan. Thus, according to the results of the pre-exit poll survey aimed at studying public attitude to the activities of President Ilham Aliyev, one can say that the population trusts the government of Ilham Aliyev and supports his political course, Birnbaum noted. He expressed hope that that the results of the exit poll to be held during the presidential election April 11, 2018 will coincide with the results of the pre-exit poll survey.